We have been hearing about Gladiator Shows that where Held in Big Arena's during the Roman Days. They sound very Barbaric to us. But the original Architect of these Shows is Satan himself. This was the Fallen Angels ARENA, that they Created as Venomous, Predators, who roam around seeking whom they can Devour. The Roman Arena was just a down graded version of their Original ARENA. These Predators Inhabit the outer regions of Space. This is what is Called the WILDERNESS, which is now a Waste Land. This is the enemies territory. This is where JESUS and his ANGELS fought a Battle for 40 Days, as the Beast Fighters, in the Gladiator Arena of the Wilderness or Waste Land of Space. SPACE. GULF in SPACE. LONELINESS. Waste, Desolation. Lay Waste, come to naught. It certainly does not mean the local desert!! Mar 1:12 ¶ And immediately the Spirit driveth him into the wilderness. Jesus was DRIVEN and TAKEN UP to the WILDERNESS by the Holy Spirit. Into empty Space, Chasm, Impassable Gulf Expansion. These words are in the REAL GREEK Translation!!!! 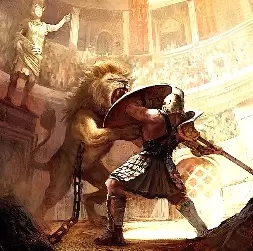 Wild Game, Hunting, Destruction, Trap, to be a BEAST FIGHTER, in a Gladiator show. Wild Beast also means, fight with Wild beast, venomous, dangerous animals. Encounter furious men. Jesus was driven into the Wilderness of SPACE to FIGHT with the Predators or Wild Beasts the Fallen Angels, where he was In a MULTI DIMENSIONAL ARENA, fighting as a BEAST FIGHTER for the captives of this Prison, Earth. This was a 40-Day Gladiator, Wild Beast Show. JESUS was Fighting as a Beast Fighter for 40 Days for us, along with his HOLY ANGELS who where there Ministering with him. This takes the Word MINISTERING to a whole new level. Outer Space, or Wilderness, is the Enemies Domain. This is his ARENA, and this is where he puts on SHOWS for the entertainment of the Fallen. He thought JESUS would be easy Prey. OT/ Devour/ strong's definition/ 398,402. Consume, Burn Up, Dine, Eat, Food, Meat. NT Definition Devour/ 2596, 2666, 2719. Gulp down, Swallow, To eat, Down Fall, Defraud, beguile of reward.. This Wilderness is Inhabited by the FALLEN ANGELS, who are constantly seeking whom they may Devour. Man is trying to go into outer Space, thinking this is a Place he can Conqueror? JESUS was in the Wilderness of Space, where he fought as our GLADIATOR, our Champion. He fought for us for 40 days, and the ENEMY LOST that round. The HOLY ANGELS where there Fighting along with him, for us. Angels ministered unto him, means they where Pursing in a hostile manner. They where suffering persecution and mistreatment with him. This was the Battle of the AGES and we have been reading right over it for 2,000 years. OUR CHAMPION JESUS is a BEAST FIGHTER. 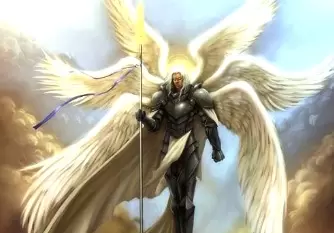 HIS HOLY ANGELS are Also Beast Fighters, which leaves us as his HEIRS, the Next Generation of BEAST FIGHTERS? THIS IS WHY WE are CALLED to be CONQUERORS, since these PREDATORS are who we are FACED with. YES JESUS over came them, BUT we OVER COME them through STANDING in his VICTORY. This means we can CONQUEROR WILD BEASTS. By STANDING in that VICTORY and Defeat the enemy over, and over, and over, and over, and over into infinity. We are to become the NEXT GENERATION of BEAST FIGHTERS. LIVING to RELIVE that VICTORY just to see the enemy Defeated once again. Space is a wilderness, because the Fallen Angels have consumed all the resources there, and have made it desolate. It is empty of any Life. Only Predators roam there seeking something to devour. Predators that devour life in any form. Man is easy prey for them. There ways are over mans head to comprehend. Outer Space is not the final frontier. It is the Dead Zone. The Wilderness. 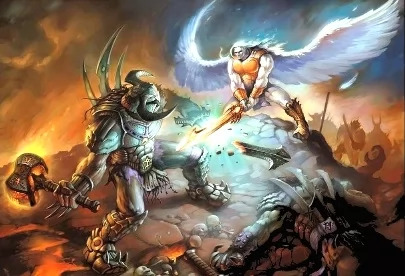 Yes there was a WAR in SPACE and the Angels fought against the Dragon, the old serpent the devil, the Beast, and the Holy ANGELS WON, they Cast him down, and JESUS took him out. THE SPIRIT is the FINAL FRONTIER. And the beast was given a mouth uttering haughty and blasphemous words, and it was allowed to exercise authority for forty-two months. It opened its mouth to utter blasphemies against God, blaspheming his name and his dwelling, that is, those who dwell in heaven. Then the man of sin, the lawless one will be revealed and the Lord Jesus will destroy him by what he says. When the Lord Jesus comes, his appearance will put an end to this man, with the splendour of His Coming. Being led, or carried by the Spirit is a Real event. LED UP of the SPIRIT. In Kings, and even in Acts. For all who are led by the Spirit of God are sons of God. So being Led by the Spirit can lead you into the Wilderness to fight Wild Beasts? Or just Carry you away to another Place. to lay snare, to plot against, to bring in order to subdue. to put words in order. threaten, warn / .